I was served two, distinct takes on Irish food this week. 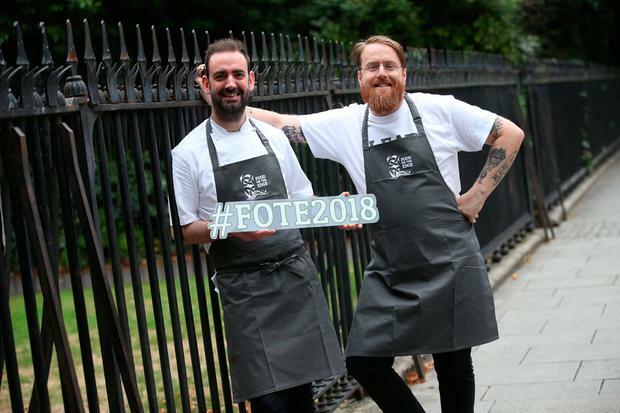 The first came at the launch of Food on the Edge 2018, a cutting-edge symposium that continues to seduce rock star chefs like Virgillio Martínez, Nathan Outlaw and Angela Hartnett to Galway. The second was Lonely Planet’s ‘Ultimate Eatlist’, a new ranking of the world’s Top 500 food experiences. Its highest Irish entry? That’ll be “Irish stew and a pint of the black stuff”, at No. 47. Two takes on Irish food — one a series of cheffy conversations; the other a warm but weary stereotype. Don’t get me wrong. Irish stew is the business — at its best, a beautiful dish that speaks to our history, landscape and food culture. But LP’s choice ignores everything that is exciting about eating on this island. How can we bridge the gap between the two? “I eat, therefore I farm,” proclaimed the T-shirt worn by JP McMahon (above), the chef launching Food on the Edge (foodontheedge.ie; Oct 22-23). And certainly, Irish produce and producers, from seafood to cheese, breads to beef, whiskey to beer, have never been better (read Aoife Carrigy on amazing Irish produce here). A new generation of young chefs — like Killian Crowley, San Pellegrino’s Young Chef of the Year for the UK and Ireland, who works with McMahon in Aniar — are channelling those raw ingredients into thrilling dishes. It’s not always consistent, but Irish food is in very good hands, and its potential to inspire engaged, high-spending travellers is mouthwatering. I regularly meet US visitors who are blown away by the gap between perceptions and reality. So, how can we get the word out? One trigger would be a breakout restaurant, similar to Noma in Copenhagen. But we can’t control that, and Michelin and the World’s 50 Best Restaurants do not favour Ireland. Media exposure is important, as is a solid take-up of Fáilte Ireland’s new Food Tourism Strategy, which promises to pair overseas marketing with initiatives like food festivals, trails and ensuring visitor attractions and pubs use local foods. But most of all, it comes down to us. Irish food is not about Instagram. It’s about what we put into our bodies. As a parent, I know how hard it is to break eating and cooking habits. But if we can challenge ourselves to try a new Irish ingredient in the weekly shop, to treat ourselves to an exciting Irish restaurant or local food tour, we’ll support local businesses, learn more about food and health, and bit by bit, meal by meal, we’ll play our part in Ireland’s food story too. The more we spread the word, the more publications like Lonely Planet will listen. Tuck in!